Last night the Alphabet Network aired a two-hour "Prime Time Special" that was anything but "special." Talk about false advertising. According to the official press release for DAVID BLAINE: DIVE OF DEATH, ABC-TV's spin meisters teased potential viewers by saying, "How will he exit from his perch overlooking NYC? Details of Blaine's heart-stopping plunge at the conclusion of the special are a closely-guarded secret. He will surprise us all -- live!" And what a surprise it was -- the "plunge" from his perch was more like a "flutter" as Blaine was oh-so-gently lowered a not-so-impressive 44 feet (by a clearly visible cable no less) to the stage floor only to then be lifted slowly back into the nighttime sky to (supposedly) make it look like Blaine magically disappears into the black ether over New York's Central Park. No lights followed him once he was above the scaffolding from which he was originally lowered and so, predictably, the screen turns jet black as the camera continues to tilt upward into darkness and the crane obviously hoisting Blaine skyward remains unseen. A millesecond later fast moving credits zip past the now-blank screen and, just as quickly and most importantly, the television viewing audience realizes it has been cheated. Host John Saunders perhaps felt the most cheated of all -- he's virtually speechless at what can only be described as the most pathetic, unbelievable climax since the Paris Hilton video. You could almost hear Herve Villechaize yelling, "Da crane! Da crane!" When it comes to ascensions, I think Christ may have done it better; I certainly know Mary Martin did. Pre-recorded segments appearing prior to the heralded "Dive Of Death" (I am chuckling as I write these words) were more engaging. Catching a .22 calbre bullet fired into a metal cup placed in Blaine's mouth was modestly interesting, and his card tricks among the most disenfranchised Americans (New Orleans Ninth Ward, West Virginia coal miners, Harlem street urchins -- where were the Wall Street suits?) were among the best I've ever seen. 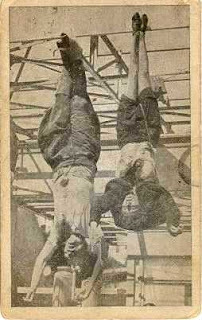 But when it comes to hanging upside down (60 hours, regular toilet breaks notwithstanding), I believe Mussolini and his mistress were far more memorable. Blaine's "Dive of Death" makes the Snake River jump look good. He is, at best, Houdini Lite. And he's never made the trains run on time either.